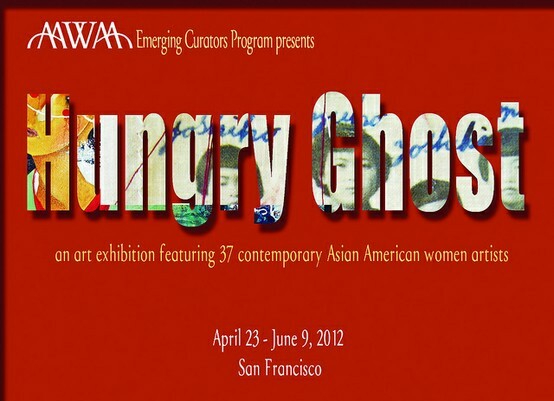 If you’re in the San Francisco Bay Area, check out the Hungry Ghost Art Exhibit presented by the Asian American Women Artists Association (AAWAA, sort of like Aiya!, the sound your mother made when your childhood self expressed interest in becoming an artist). If you look closely at the photo, you might recognize one of my old HapaMama food posts, plus a new piece of installation art. 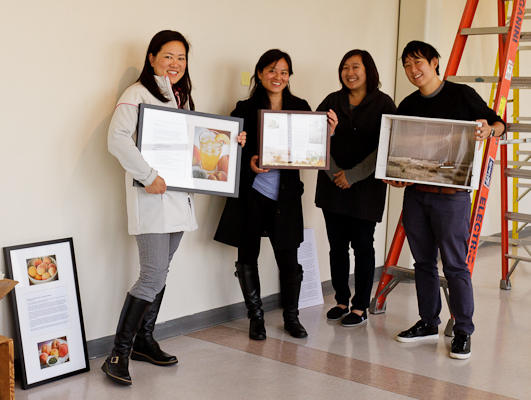 Nearly 40 Asian American women artists — including writers, painters, sculptors, and photographers — are featured in this exhibit, which is part of AAWAA’s Emerging Curator’s Program. 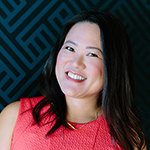 And the curator is Lisa Chiu, a fellow Taiwanese American blogger whose hilarious, and sometimes heartbreaking, observations can be found at Ravings, Rants and Ruminations. The theme, Hungry Ghost: Yearning for Fulfillment, is a concept based in Buddhist and Taoist beliefs. A Hungry Ghost is a lost soul that roams burdened by unmet needs. Driven by insatiable greed and intense desires, the Hungry Ghost wanders, searches and feeds. Lincoln Blvd. & Torney Ave. Note: the Thoreau Center is open during regular business hours, but there will be an opening reception at the gallery next week. If you’re around, stop by, you may even meet some of the artists! @Nikki, I’ll give you a hint since you don’t live close enough to view the art show in person :) If you look closely at the photo and click on the link to the blog post, you’ll see some of the essay and photography in the exhibit. But there’s a few new pieces on display, too. I had to leave before the gallery was set up, but hopefully I’ll be able to head up there sometime and post some photos of the finished display! CONGRATULATIONS, Grace, that is totally AWESOME!! My husband and I were planning on a trip to San Francisco soon, we wanted to make a day of it, and visit a couple of restaurant that have called our attention. Now we have one more thing we want to do, and that is to visit your exhibit. @Virginia, the exhibit will be on display until June 9. The only trick is that it’s inside the Tides Center, which is an office at the old Presidio, so I think you have to go there during regular business hours to view it. Thank you so much for your support!